The heart is located in the thoracic cavity between the lungs within the mediastinum. It is a hollow, cone-shaped, muscular organ about the size of a fist. Figure 12.1 shows that the base (the widest part) of the heart is superior to its apex (the pointed tip), which rests on the diaphragm. Also, the heart is on a slant; the base is directed toward the right shoulder, and the apex points to the left hip. The base is deep to the second rib, and the apex is at the level of the fifth intercostal space. 4. regulates the blood supply based on the current needs of the body. Figure 12.1 Cardiovascular system. The right side of the heart pumps blood through vessels of the pulmonary circuit. The left side of the heart pumps blood through vessels of the systemic circuit. 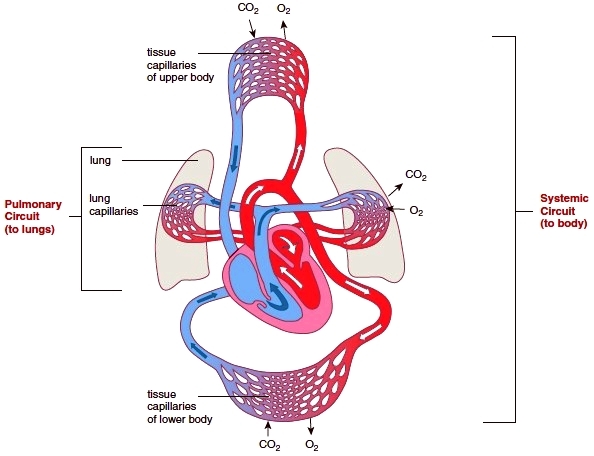 Gas exchange occurs as blood passes through lung (pulmonary) capillaries. Gas exchange and nutrient-for-waste exchange occur as blood passes through tissue (systemic) capillaries. In this illustration, red vessels carry O2-rich blood, and blue vessels carry O2-poor blood. The heart is enclosed by a two-layered serous membrane called the pericardium. One layer, the visceral (meaning “organ”) pericardium, is considered part of the heart wall; it forms the epicardium, the outer surface of the heart. The myocardium is the thickest part of the heart wall and is made up of cardiac muscle (see Fig. 4.13). When cardiac muscle fibers contract, the heart beats. The inner endocardium is composed of simple squamous epithelium. Endothelium not only lines the heart, but it also continues into and lines the blood vessels. Its smooth nature helps prevent blood from clotting unnecessarily. 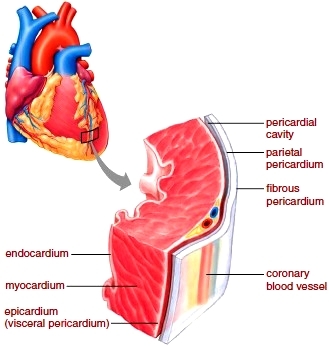 The pericardial cavity, which contains a few milliliters of pericardial fluid, develops when the visceral pericardium doubles back to become the parietal (meaning “wall”) pericardium, the other serous layer. The pericardial fluid reduces friction as the heart beats. The parietal pericardium is fused to a fibrous pericardium (Fig. 12.2). The fibrous pericardium is a layer of fibrous connective tissue that adheres to the great blood vessels at the heart’s base and anchors the heart to the wall of the mediastinum. The coverings of the heart confine the heart to its location while still allowing it to contract and carry out its function of pumping the blood. A layer of the heart can become inflamed due to infection, cancer, injury, or a complication of surgery. The suffix “itis” added to the name of a heart condition tells which layer is affected. For example, pericarditis refers to inflammation of the pericardium, and endocarditis refers to inflammation of the endocardium. Figure 12.2 The coverings and wall of the heart. The heart wall has three layers, from deep to superficial: endocardium, myocardium, and epicardium. The heart has four hollow chambers: two superior atria (sing., atrium) and two inferior ventricles (Fig. 12.3). Each atrium has a wrinkled anterior pouch called an auricle. Internally, the atria are separated by the interatrial septum, and the ventricles are separated by the interventricular septum. Therefore, the heart has a left and a right side. The thickness of a chamber’s myocardium is suited to its function. The atria have thin walls, and they send blood into the adjacent ventricles. The ventricles are thicker, and they pump blood into blood vessels that travel to parts of the body. The left ventricle has a thicker wall than the right ventricle; the right ventricle pumps blood to the lungs, which are nearby. The left ventricle pumps blood to all the other parts of the body. At its posterior wall, the right atrium receives O2-poor blood from three veins: the superior vena cava, the coronary sinus, and the inferior vena cava. Venous blood passes from the right atrium into the right ventricle through an atrioventricular (AV) valve. This valve, like the other heart valves, directs the flow of blood and prevents any backflow. The AV valve on the right side of the heart is specifically called the tricuspid valve because it has three cusps, or flaps. In the right ventricle, the cusps of the tricuspid valve are connected to fibrous cords, called the chordae tendineae (meaning “heart strings”). The chordae tendineae in turn are connected to the papillary muscles, which are conical extensions of the myocardium. Blood from the right ventricle passes through a semilunar valve into the pulmonary trunk. Semilunar valves are so called because their cusps are thought to resemble halfmoons. This particular semilunar valve, called the pulmonary semilunar valve, prevents blood from flowing back into the right ventricle. Note in Figure 12.3 that the pulmonary trunk divides into the left and right pulmonary arteries. 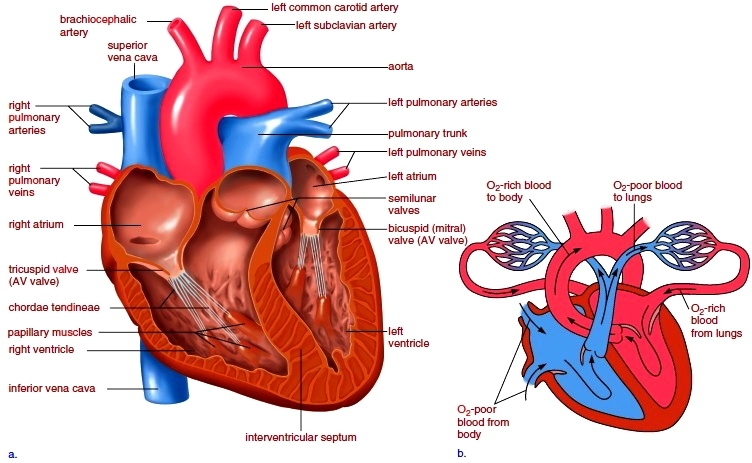 For help in remembering how blood flows through the heart, trace the path of O2- poor blood from the vena cava to the pulmonary arteries that take blood to the lungs (see Figs. 12.1 and 12.3b). At its posterior wall, the left atrium receives O2-rich blood from four pulmonary veins. Two pulmonary veins come from each lung. Blood passes from the left atrium into the left ventricle through an AV valve. The AV valve on the left side is specifically called the bicuspid (mitral) valve because it has two cusps. The left ventricle forms the apex of the heart. The cavity of the left ventricle is oval-shaped, while that of the right ventricle is crescent-shaped. The papillary muscles in the left ventricle are quite large, and the chordae tendineae attached to the AV valve are thicker and stronger than those in the right ventricle. As mentioned, the AV valve on the left side is also called the bicuspid (or mitral) valve. Blood passes from the left ventricle through a semilunar valve into the aorta. This semilunar valve is appropriately called the aortic semilunar valve. The semilunar cusps of this valve are larger and thicker than those of the pulmonary semilunar valve. Just beyond the aortic semilunar valve, some blood passes into the coronary arteries, blood vessels that lie on and nourish the heart itself. The rest of the blood stays in the aorta, which continues as the arch of the aorta and then the descending aorta. To make sure you understand this discussion, trace the path of O2-rich blood through the heart, from the pulmonary veins to the aorta (see Figs. 12.1 and 12.3b). Figure 12.3 Internal heart anatomy. a. The heart has four valves. The two atrioventricular valves allow blood to pass from the atria to the ventricles, and the two semilunar valves allow blood to pass out of the heart. b. A diagrammatic representation of the heart allows you to trace the path of the blood through the heart.